American dollar is losing to Canadian, Australian and even to Singaporean dollar and losing so fast that its parity changes before the flight originating from Los Angeles lands at Sydney. This rings alarms bells but nobody seems to be listening. Does the losing American dollar signal America’s loss of its economic hegemony? Will China be crowned as economic power much ahead of the estimates? Does it have anything to do with steady rise in the price of gold? The events are unfolding at pretty faster pace. 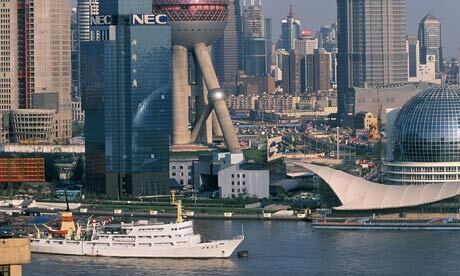 The economic gurus had predicted China to be Number One economic power of the world by 2050. Some more ambitious had set this date somewhere closer to 2030. But the International Monetary Fund has rejected all those estimates and has just dropped a bombshell. For the first time, the international organization has set a date for the moment when the “Age of America” will end and the U.S. economy will be overtaken by that of China. And it’s a lot closer than you may think. According to the latest IMF official forecasts, China’s economy will surpass that of America in real terms in 2016 — just five years from now. According to Market Watch, the IMF assessment provides a painful context for the budget wrangling taking place in Washington right now. It raises enormous questions about what the international security system is going to look like in just a handful of years. And it casts a deepening cloud over both the U.S. dollar and the giant Treasury market, which have been propped up for decades by their privileged status as the liabilities of the world’s hegemonic power. According to the IMF forecast, which was quietly posted on the Fund’s website just two weeks ago, whoever is elected U.S. president next year will be the last to preside over the world’s largest economy. Most people aren’t prepared for this because they were looking at GDP to make comparison between China and the USA using current exchange rates. IMF analysis also looked to the true, real-terms picture of the economies using “purchasing power parities.” That compares what people earn and spend in real terms in their domestic economies. Under PPP, the Chinese economy will expand from $11.2 trillion this year to $19 trillion in 2016. Meanwhile the size of the U.S. economy will rise from $15.2 trillion to $18.8 trillion. That would take America’s share of the world output down to 17.7%, the lowest in modern times. China’s would reach 18%, and rising. Just 10 years ago, the U.S. economy was three times the size of China’s. The report says that this is more than a statistical story. It is the end of the Age of America or its economic hegemony. We have lived in a world dominated by the U.S. for so long that there is no longer anyone alive who remembers anything else. America overtook Great Britain as the world’s leading economic power in the 1890s and never looked back. China’s neighbors in Asia are already waking up to the new reality. The rise of China, and the relative decline of America, is the biggest story of our time. You can see its implications everywhere, from shuttered factories in the Midwest to soaring costs of oil and other commodities. Last fall, when I attended a conference in London about agricultural investment, I was struck by the number of people there who told stories about Chinese interests snapping up farmland and foodstuff supplies — from South America to China and elsewhere. This is the result of decades during which China has successfully pursued economic policies aimed at national expansion and power, while the U.S. has embraced either free trade or, for want of a better term, economic appeasement. What the rise of China means for defense, and international affairs, has barely been touched on. The U.S. is now spending gigantic sums — from a beleaguered economy — to try to maintain its place in the sun. It’s a lesson we could learn more cheaply from the sad story of the British, Spanish and other empires. It doesn’t work. You can’t stay on top if your economy doesn’t. Equally to the point, here is what this means economically, and for investors. The U.S. Treasury market continues to operate on the assumption that it will always remain the global benchmark of money. Business schools still teach students, for example, that the interest rate on the 10-year Treasury bond is the “risk-free rate” on money. And so it has been for more than a century. But that’s all based on the Age of America. No wonder so many have been buying gold. If the U.S. dollar ceases to be the world’s sole reserve currency, what will be? The euro would be fine if it acts like the old Deutschmark. If it’s just the Greek drachma in drag … not so much. The Age of America comes to an end, finally…..
Oil prices fall after UN’s resolution on Libya…. 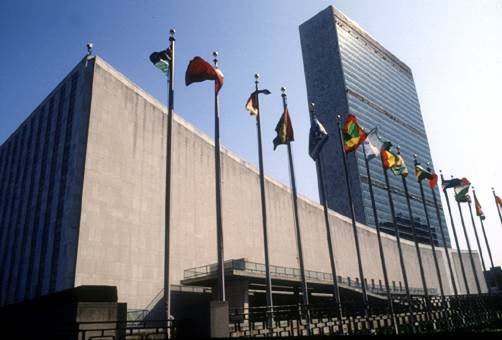 The United Nations acted swiftly to salvage the situation in Libya which could otherwise trigger economic crisis for the West. The effect of this resolution was visible when oil prices fell Friday after Libya agreed to an immediate cease-fire and stop to military operations. But did the prices plunge as a result of this decision alone? Analysts say that Libya’s decision to cease-fire was not voluntary; it was taken after the UN passed a resolution late Thursday night. According to Forbes, the heated political environment in the Middle East is still adding to uncertainty among investors in the longevity of energy prices, which have produced a 30% increase in gasoline prices for U.S. consumers from the same time last year. WTI crude oil fell 0.7% to $100.70 per barrel Friday morning. According to a report in the Financial Times, the ceasefire with rebels was announced amid concerns in Tripoli that Thursday’s United Nations resolution calling for an end to the fighting could create a de facto partition of east and west Libya. “Libya will accept that it is obliged to accept the UN Security Council resolution and has decided an immediate ceasefire and the stoppage of all military operations” Mr Koussa, Libyan Foreign Minister told a press conference in Tripoli on Friday. International media, however, could not confirm if the cease-fire had actually taken place. The town of Misrata, to the east of Tripoli, was reported on Friday morning to be under attack by government forces, according to residents. Mr Koussa declined to answer reporters’ questions about what was happening in Misrata after he read a brief prepared statement. The ceasefire was greeted with jubilation in Benghazi, where crowds gathered in the streets to cheer the news. Libyan turmoil starts taking its toll on global economies…. The upheaval in North Africa and Middle East may not actually travel to other countries but its adverse affects have already reached every nook and corner of the world. It is going to hit hard every economy but will be nightmarish for poorer economies and poor segments of all societies. Pakistan’s fragile economy will be hit even harder where political compulsions keep the government from taking difficult decisions. The surge in oil prices will push the prices upward which will life of ordinary citizen even more difficult. As predicted in these page, the Libyan turmoil has finally started showing its teeth and taking its toll; the world economies are at the brink of yet another crisis as oil surges to almost $120 a barrel and the safe-haven Swiss franc hit a record high on Thursday on fears that turmoil in Libya could spread.US equity markets also hovered near break-even after this week’s sharp slide. Analysts said it was too soon to say a long-expected sell-off on Wall Street was over with unrest in North Africa and the Middle East still alive. The escalating violence in Libya, home to Africa’s largest proven oil reserves, lifted benchmark Brent crude oil to its highest level since August 2008 and kindled concerns of an inflationary spike that might stall global recovery. This week’s relentless surge in oil prices stung the US dollar against major currencies. The Swiss franc benefited from the turmoil in North Africa while the euro extended gains against the dollar on expectations interest rates in the euro zone will rise earlier than those in the United States. The dollar fell to a record low of 0.9240 of a Swiss franc on electronic trading platform EBS. Copper, considered a harbinger of economic sentiment, firmed after better than expected US jobless data, but it remained under pressure on concerns that higher oil prices driven by violence in Libya could slow economic growth. 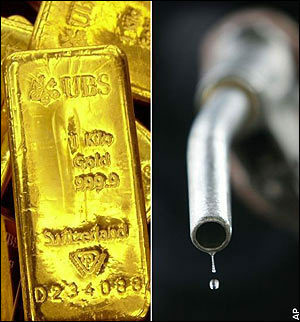 Brent crude futures for April delivery spiked to $119.79 a barrel before easing to $114.55, up $3.30 on the day. US light sweet crude oil also rose but remained under the $100 mark it touched on Wednesday for the first time since October 2008. Spot gold prices rose slightly to $1,412.00 an ounce, up just $2.05. The Financial Times quoted an unnamed official as saying Saudi Arabia was in active talks with European refiners who may be hit by a disruption in Libyan exports. Forces loyal to Muammar Gaddafi launched a counter-attack but rebels threatened the Libyan leader’s grip on power by seizing important towns close to the capital and bringing the tide of rebellion ever closer to his power base. Disruption to Libya’s output has cut at least 400,000 of the country’s 1.6 million barrels per day production, Reuters calculations show. Italian oil company, ENI said the decline was greater, estimating 1.2 million barrels of oil had been removed from the market. Pakistan stock market also lost hope in domestic political stability amid rumors of Punjab government split and Karachi Stock Exchange (KSE) on Friday tumbled by more than 3.5 percent on foreign selling and political uncertainty. There was panic selling in the market. As reported by Business Recorder. Foreign investors sold because of the global sell-off, political un-certainty and the rise in international oil prices. KSE benchmark 100-share index was 3.59 percent, or 405.24 points, lower at 11,134.02 on turnover of 104.86 million shares by 3:32 p.m.
Last relic of the Great Game disappears, bit by bit…. Pakistan government has announced on the eve of visit of US Vice President, Joe Biden, that it will not allow any Great Game in the region. In order to demonstrate its commitment to this stand, the government has announced to close, bit by bit, the last relic of the Great Game, namely Pakistan Railways. History tells us that the Railways was an effective means of playing the Great Game on this side of the Durand Line. The need to connect India to Afghanistan through railways for transporting the troops was felt when Russia extended it rail network to the Khanates of Central Asia. Since 1861 when the first railway line was laid down between Karachi and Kotri, the expansion of the railway network by the British came at a rapid pace up until 1947. The driving factors for this growth were strategic and economic in nature. For instance to thwart the Russians from the West, the British built the Khojak tunnel, the fourth largest at that time, in seemingly inaccessible areas of Balochistan to reach Chaman railway station. But after 1947, little has been done to expand and maintain this network. According to Pakistan Railways, the network forms the life line of the country by catering to its needs for large-scale movement of freight as well as passenger traffic. It not only contributes to its economic growth but also promotes national integration. Pakistan Railways endeavors to run the trains strictly in accordance to time-table and maintain high standard of punctuality. The progressive freight train sport organization operated by professional management and competent staff committed to provide reliable, competitive and economical service of recognized standards to its customers. This life line, like others, is being effectively squeezed. This public state enterprise which is also the largest civil employer in the country is facing the worst crisis of survival. Over the years, lack of attention, poor policies, increasing expenditures, misappropriation of funds, pilferage, nepotism and most recently, the floods have left the Railways with huge deficits running in billions of rupees. Pakistan Railways had already shut down 39 freight trains because of fuel shortage. Karakoram passenger train on Thursday, which left Lahore for Karachi was delayed by an hour at the Faisalabad railway station because it was not refilled at the Lahore station. Sources from PR said that due to the financial crunch, an estimated budget of Rs613 billion is unlikely to be met as after six months of the present fiscal year, it has just received Rs21 billion. The major losses faced by the Pakistan Railways today are a direct result of decreasing revenues with increased expenditures. The expenditure recently crossed Rs.51 billion in one year out of which Rs.20 billion were allocated for salaries and pensions. The revenues are dwindling to about Rs.23 billion per year. Revenue share for freight trains has declined from 40 per cent to 25 per cent as a direct result of neglecting this cheap mode of transportation. While on the other side of the border, Indian railways expanded due to transportation of goods across the country, here in Pakistan another institution called National Logistic Cell (NLC) was setup for the transportation of goods– an institution that directly competed with Pakistan Railways. As NLC’s role grew in the Afghan war and in the later years, Pakistan Railways was sidelined further as it became irrelevant with each passing day. The rising oil prices and scarcity of locomotives forced the Railways to focus on passenger traffic more than the transportation of goods. The fares were kept low as the government kept subsidizing the department. Pakistan Railways recently absorbed Rs.14 billion of taxpayers’ money in the form of direct subsidies. 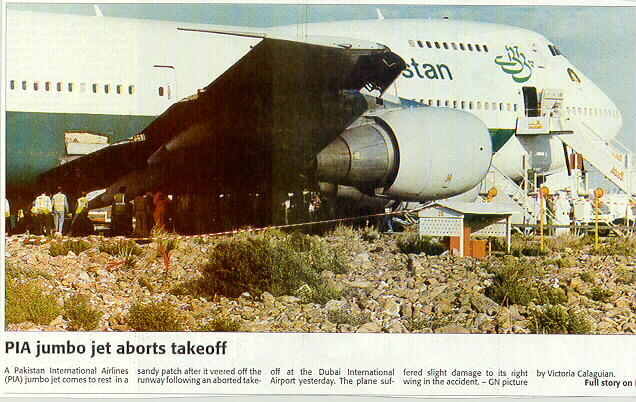 Out of 522 total engines only 220 are in working order, out of which 100 are in poor condition. According to DAWN, nature has not been too kind to Pakistan Railways either. 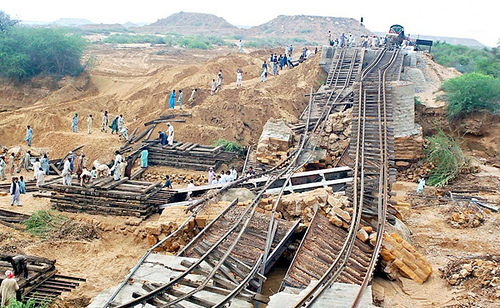 According to the National Disaster Management Authority, the recent floods have caused a loss of Rs.6.7 billion to the railway network as several hundred kilometers of lines were washed away. The railway coaches were also the targets of angry mobs and arson attacks after Benazir Bhutto’s assassination resulting in huge losses. The newspaper quotes a recent report of Auditor-General Pakistan which revealed that Pakistan Railways has also been maltreated by other institutions as it has often failed to recover its outstanding dues. “Overall receivables of Pakistan Railways shot up to Rs 1.438 billion until June 30, 2009, while one of the major receivables — amounting to Rs.254 million — is related to Defense Department — which is yet to be recovered from certain department,” claimed AGP. Similarly the recent scandal of Royal Palm Golf and Country Club only highlighted a wider practice of illegal encroachment of land of railways over the years. With a rapid increase in the losses incurred and suspension of many trains over the last few years, the graph of Pakistan Railways is only going down and its future looks uncertain. Click here to support Save Pakistan Railway cause. Dollar-lust will trigger worst-ever food crisis…. Remember the export of wheat about three years ago by Pakistan triggering a very serious food shortage in the country leading to phenomenal rise in food prices? The same wheat was imported back at exorbitant prices. Since then the price of wheat and flour is constantly on the rise. This was perhaps one of the biggest corruption scandals of the Shaukat Aziz government. It seems that the present government has learnt only one lesson from this regrettable decision; do it again and make billions at the cost of millions of hapless “voters” who you will need only in the next season of “democracy”. 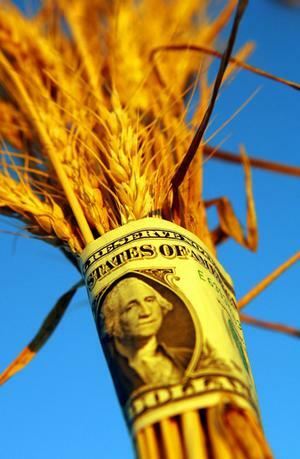 Interestingly, this decision, which has been taken to be able to pay off central bank loans, has been taken at a moment when wheat prices are at the lowest in the international market. It is simply beyond comprehension why export is needed to pay off SBP loans which essentially are in local currency. It seems that the driving factor behind this imprudent decision is dollar-lust. Express Tribune has reported that after a ban stretching more than three years, the government on Tuesday allowed the export of wheat in a bid to pay back central bank debt, a move that could result in a serious food crisis since a World Bank (WB) report has already warned of a five-million-ton drop in production in the next crop. 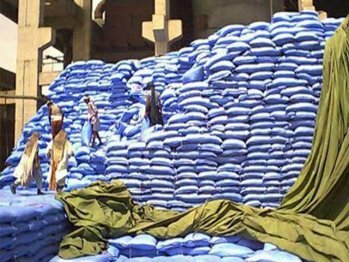 The Economic Coordination Committee (ECC) of the cabinet allowed the grain export without imposing any cap on quantity. It is expected that wheat will be exported in massive quantities since Russia, the world’s largest wheat producer, has banned the grain export resulting in price surge in the international market. The ECC assessed a $300 per ton (Rs1,040 per 40 kilogram) wheat price in the international market, anticipating a further hike in coming days. Although the government has fixed the wheat price at Rs950 per 40 kg in the domestic market, farmers usually receive an average Rs850. Pakistan is the third largest wheat producer. The ban on export of wheat was slapped in June 2007 when because of incoherent policies the country first exported the commodity and then had to spend over $1 billion to import the same for domestic consumption. The ministry of food and agriculture’s summary to the ECC proposed lifting the ban primarily to pay back debt taken from the State Bank of Pakistan (SBP) to buy wheat, make room for next year’s crop storage and capitalize on higher prices in the international market. Total wheat stocks are estimated at 9.07 million tons, of which 6.1 million tons are in Punjab. “The Punjab government is paying Rs77.5 million per day interest on loans,” obtained for buying wheat, says the summary. The federal government is picking up Rs24.6 million from the amount. The report goes on to say that there is concern about the possible impact of reduced wheat output in the coming season on food security. Around 78,000 tons of wheat were either destroyed or damaged in Punjab during the recent floods. How can you enjoy your dinner Mr. Prime Minister…. Those who brought you to the corridors of power are hungry and sick and shelter-less. The statistics released by the World Food Program is chilling and shocking. It says that many million “vote” are in such a situation that it can put anyone to shame. You are going to need them in the near future but they need you now. Can you act quickly enough to help them at least with the intention to grab their votes two years from now, if you can still enjoy your dinner? This should also shock Angelina Jolie who could not believe her eyes when she saw your dinner table. No one with a heart and right mind can reconcile to the situation of the voters and the voted. a) The Pakistan floods this summer impacted the lives and livelihoods of some 20 million people, around 10 million of whom required emergency food assistance. b) Pakistan suffered from widespread hunger even before the monsoon floods, with an estimated 82.6 million people – a little less than half the population – estimated to be food insecure. 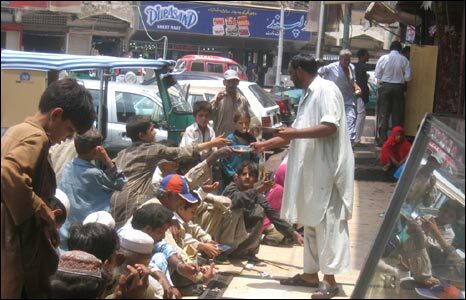 c) An estimated 36 percent of Pakistanis live below the poverty line and almost half are illiterate. Poorer households typically spend over 60 percent of their income on food. d) 50 percent of all Pakistanis have little or no access to clean toilets and drinking water, a condition that renders them vulnerable to infectious diseases. e) The biggest killers of children under five in Pakistan are diarrhea and acute respiratory infections. Undernourishment is an underlying cause in 38 percent of those cases. f) Conflict along Pakistan’s northwestern border with Afghanistan has forced millions of people to flee their homes. Since 2008, WFP has provided over 2.6 million of them with food assistance. g) Volatile food prices over the past seven years have pushed the number of people who depend on food assistance in Pakistan from 38 percent of the population in 2003 to 49 percent in 2009.
h) Wheat is Pakistan’s main staple crop and most important source of calories. As a result of the flooding, which submerged around 16 percent of all arable land in Pakistan, the upcoming wheat harvest is expected to be around 15 percent smaller than usual. Hunt down sugar hoarders to control inflation….a la China. Inflation is reflected in the rise in prices of daily use items and technically indicates that the gap between demand and supply is widening. It is not an economic ill itself; it is a symptom of the fact that a country’s economy is not being managed efficiently and properly. It is measured through various price indices prepared by the statistical organizations. As it is not always possible to increase the supply of goods and services to bridge the gap, central banks try to control inflation through controlling the money supply. This is done through various monetary policy instruments. When there is less money supply and people find other alternatives more attractive to park their money in, the prices come down. This is a conventional instrument. However, when the increase in prices is due to unconventional factors like hoarding, which is being done in Pakistan in case of Pakistan, the countries need to take unconventional measures. That has recently happened in China. The Economist has reported that the State Council, China’s cabinet, promised “forceful measures” to stabilize prices. It said it would drum up supply and crack down on hoarders and speculators. It even threatened to “interfere” with the prices of daily necessities, which might include grains, cooking oils, sugar and cotton. Imagine, the scale of inflation is not yet a threat to the republic in China. But consumer prices rose by 4.4% in the year to October, the fastest rise for over two years. Food prices, which account for more than a third of the consumer-price index, are largely to blame: vegetables are almost a third more expensive than they were a year ago. Even the most exotic commodities have been affected. As China’s prices rise, consumer confidence and the stock markets are falling. Shanghai shares have fallen by a tenth since the inflation figures came out. Rising food prices may explain China’s inflation, but what is behind their rise? Floods, including a deluge in Hainan province last month, hurt some crops. Harvests have also disappointed elsewhere in the world: the UN’s Food and Agriculture Organization said this week that the cost of the world’s food imports may exceed $1 trillion this year, only $5 billion short of the record bill in 2008. The macroeconomic weather has also played a role. China’s banks appear determined to breach their quota of 7.5 trillion Yuan ($1.1 trillion) of new loans this year. The People’s Bank of China raised their reserve requirements this month for the fourth time this year and lifted interest rates in October for the first time since 2007. But neither step will do much to constrain banks swimming in deposits and lending to an economy growing, in nominal terms, by 15% a year. And so the government is reaching for less conventional weapons. To shield the vulnerable, it urged local governments to raise unemployment benefits, pensions and the minimum wage in line with inflation. It also promises to increase shipments of cotton from the western region of Xinjiang, and to cut the price of electricity, gas and rail transport for fertilizer makers. To keep the population sweet, on November 22nd it will sell 200,000 tonnes of sugar. If extra supplies do not curb prices, the government may set caps. It may repeat the kinds of measures it imposed in 2008, when food inflation topped 23% after an outbreak of disease killed many of China’s pigs. Then, the government required sellers of pork, rice, noodles, cooking oil and other staples to ask permission before raising their prices. Such controls serve as an “extreme signal” of the government’s determination to fight inflation, note Mark Williams and Qinwei Wang of Capital Economics. That may help quash self-fulfilling expectations of higher prices. But beyond that, price controls have “little to commend them.” If sellers cannot fetch a good price, they will limit the supply of what they offer, or adulterate the quality. Whenever the government stops petrol prices from rising in line with oil prices, queues at the pump merely lengthen. Inflation undermines capitalism, according to Keynes, in part because it discredits entrepreneurs. They become “profiteers” in the eyes of those hurt by rising prices. China’s leaders promise to hunt down and punish hoarders and speculators. According to Andy Rothman of CLSA, a broker, some traders are taking possession of agricultural commodities in the hopes that prices will rise. But how to stop households buying two bottles of cooking oil rather than one? Beware taxpayers, your blood is being injected to save PIA yet again…..
One of the major reasons for imminent collapse of Pakistan’s economy is senseless injection of liquidity into public sector corporations who suddenly started posting huge losses after the installation of the present government. This remarkable “turnaround” is rather mysterious. It is not so mysterious if a dispassionate analysis is undertaken with a non-political angle. These corporations including PIA, PSM etc have suffered due to the “doctrine of cronyism”, a hallmark of the governance of ruling party. This doctrine affected the economy every time the party came to power. According to a conservative estimate, the government in one year alone has injected liquidity close of half of its revenue receipts to keep these corporations afloat, and cronies happy. In order to overcome its economic problems, the government was forced the other day to impose RGST and flood tax which can have severe political consequences for the ruling party. But oblivious to the ramification of its style of economic management, it is still considering injecting liquidity into the loss making corporations. It is like putting the blood of poor taxpayers into the veins of these corporations. Express Tribune has reported that the ailing state carrier Pakistan International Airlines (PIA) is asking the government, saddled with its own mounting debt, to write off losses of 1.7 billion dollars to save it from looming bankruptcy. In a five-year survival plan submitted to the government, PIA has promised to make cutbacks and better its fleet in a bid to improve its fortunes, if the treasury agrees to cancel its debt and pay off other creditors. Blaming “bad policies of the past” for accumulated losses of 80 billion rupees (936 million dollars) and liabilities of 144 billion rupees, PIA insisted the airline is capable of future success. The burden would be a massive undertaking for a government dependent on US aid to survive. A economic financial adviser to the government, Ashfaq Hassan Khan, said privatization was the only long term solution for the airline, which has failed to turn a net profit since 2004 according to its last annual report. PIA was created out of private airline Orient Airways in 1955, just eight years after Pakistan came into existence, and today has a fleet of 40 planes, a combination of Boeing 747s, 777s, 737s, Airbuses and ATR aircraft. Performing well until the 1970s when corruption and overstaffing hit company fortunes, PIA’s reputation was further battered in the 1980s as it failed to maintain its fleet, said economic expert Shahidur Rehman. He said 1990 signaled further defeat for PIA, when legislation liberalized to allow more competition in the flight market. The state carrier remains the largest operator on Pakistan’s international and domestic routes. But union officials say years of corruption, nepotism, bad management and poor planning have pushed the corporation to its lowest ebb. Government fails to “sell” taxes…..
Secretary of State Hillary Clinton has put across her message without mincing words, “the Pakistani elite also need to pay up so that the world follows suit”, more or less like that. The issue of paying taxes by the salaried middle-class alone and the unjust taxation system has assumed so much significance and attracted so much attention that some pundits have started foretelling a public revolt, if not a revolution. And if Hillary can see it coming then it is coming, for sure. This elite-based taxation system will have to go away to make space for a just and equitable system in which all pay taxes according to their capacity. Due to negative media portrayal, people look upon taxation as a monster. I can’t agree with classical economists, nor with the conventional discipline of tax science. To me, taxation is merely a product of the government. I know the objection can be raised that if tax is a product, we can avoid buying it. I think we need to ignore this aspect, however, and try to make one point: everybody has to buy this product. It is a product that works for the well-being of society and helps governments work towards social and infrastructural development. That means by ‘selling’ tax, the government can generate revenue that allows it to fund projects for the public good. As I previously stated, tax is a product; therefore it follows that we, the clients, are the kings. They need to be careful not to make the “product” (i.e: tax) too expensive. It is actually revenue that is taxed, not businesses or individuals. The government needs to make sure that they take care of their clients’ revenues, for their own good. It is not advisable for them to develop tax in a way that would harm businesses, or make people poor. The focus should be on increasing prosperity, for their own long-term benefit. In order to a good relationship with their “clients” (i.e: citizens), the government needs to help people earn. This means that they have to market effectively by increasing people’s wealth, so that they are able to afford taxes. No government can be efficient if they simply collect tax, rather than investing in it. Investment in taxes means that it is necessary to multiply the number of clients-those with income and earning. The best would be to invest in establishing businesses that can increase tax revenue in the long run. It is always advisable to diversify the tax portfolio, rather than putting pressure on selling tax to just one strata of the economy. Diversification of taxes would be a great step in reducing the economy’s unrest. In countries like Pakistan, agriculture or capital gains are wholly exempt from taxation and only the salaried classes are taxed. This can lead to a point when people would rather ignore taxes than pay them. Those who are responsible for collecting taxes need to behave like salesmen. They need to discuss the means for increasing people’s revenue, so that they are able to pay more taxes. It is advisable for the government to survey tax-buyers to find out means for improving people’s cash flow. To create a tax culture, it is best to convince people that taxes are not there to harm them, but help create a more prosperous society in the long run. New client development is another thing that would help promote taxes. The government has to plan a fixed percentage of tax revenue that will be invested in promoting entrepreneurs and small businesses. When businesses grow, it would automatically increase tax revenue as well. As a business, the government has to care for its own costs. They have to use intelligent means for tax collection and need to be cost efficient. During phases where the government is investing in taxation procedures, it must keep its running costs low. In countries like Pakistan, taxes are becoming a symbol of terror. This is mainly because of the performance record of the government and their reputation for corruption. It would be best if people could pay taxes knowing that the money will be used for their own benefit. 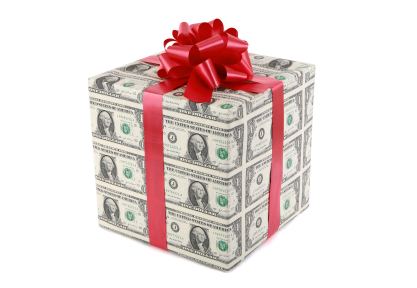 Generally, the government is thankful if if people pay the taxes that are imposed on them. Taxation should be a process whereby the taxpayer thanks the government for using his money to improve society. A little change of perspective is always required to cultivate an acceptance of something that is considered bad but may actually be very beneficial. If the reality can’t be changed for the time being, then changing perceptions may help create that change. I think it is time for tax authorities and governments to rework the concept of taxes in Pakistan. They need to build credibility and educate people about how taxes are the way to a bright future, rather than a monstrous thing to be avoided. This would require a massive endeavor from the government. I know my post of will receive a lot of criticism, but if companies can sell cigarettes that are harmful to consumers, why can’t the government sell tax, which is highly beneficial (if used sincerely). It is a time to design a framework for developing taxes, rather than imposing them by force. The best way is to take the middle path. This will come from brainstorming: our country is unique and therefore needs unique solutions. Let us welcome Zardari’s sincere initiative…. Pakistan’s President has announced that his government plans to tax the rich to help the poor i.e. flood-hit people. This sincere initiative is a happy development which should be appreciated but will the rich and mighty pay up or will they live up to their reputation of plundering but not paying back. Pakistan’s floods have placed the country at the head of a bumpy road ahead when the country is forced to make tough choices. To start with, Pakistan’s Central Bank has jacked up the interest rate which will have many implications for the flood-hit fragile economy, but the question is: did the new Governor who is an economist of international standing, have any other viable option? Businessweek in its current issue has reported that Pakistan’s deadliest floods ruined crops alone worth 281.6 billion rupees ($3.27 billion), destroying rice, cotton and sugar. And this is one of multiple official versions this time coming from the horse’s mouth, the Agriculture Minister himself. However, the floods have damaged about 10 million tons of crop, which Credit Suisse values at about $1.9 billion. In this backdrop when Pakistan’s major contributor to the GDP has suffered so badly, the inflation was already out of control and the Bretton Woods sisters had no mercy on the devastated economy and battered populace, this was probably the only thing in his power that a Central Bank governor could do to arrest the inflationary trends. Wall Street Journal has reported that it’s a decision he had to make with incomplete information. Total assessments of the damage to Pakistan’s economy from floods that began in July are still pending….He chose right. The State Bank of Pakistan on Wednesday raised its policy rate by half a percentage point to 13.5%. The paper says that holding off would have meant a risky delay of action against a worsening inflation problem. Consumer prices in Pakistan have been rising too fast for three years, with gains close to a 12% rate throughout 2010. The floods will amplify the problem, but floods aren’t the only source of a price shock in Pakistan. Islamabad is under pressure from the International Monetary Fund to increase electricity tariffs and raise general sales taxes and import duties—all of which would add fuel to the inflation problem. Not taking these steps could have the country miss out on a $3.2 billion IMF payment due by the end of this year. Pull it all together and economists at Standard Chartered expect inflation to average 15% in the fiscal year that began in July. Then there’s the fragile state of Pakistan’s economy. Flood damage means Pakistan’s critical agriculture sector will contract 1.7% this fiscal year, the sector’s first decline in a decade, Credit Suisse predicted. It means economic growth could slow to 2.5%, much slower than last year’s 4.1%, and a crawl by Pakistan’s standards. Add to this the infrastructure damage—from power plants to highways—and industrial growth, too, will suffer. The International Labor Organization estimates 5.3 million people will lose their jobs because of the flood. Raising rates, and promising to keep doing so, in such an environment is certainly not going to win Mr. Kardar any friends in the business community. But inflation is the more frightening of Pakistan’s economic challenges. Price stability is far more critical to Pakistan’s long-term growth. Foreign aid and remittances from overseas Pakistanis will ensure money flows into the economy.